If Leicester City were to win the Premier League they will pocket as much as £93 million in premier league prize money compared to £71.6m they earned last year. 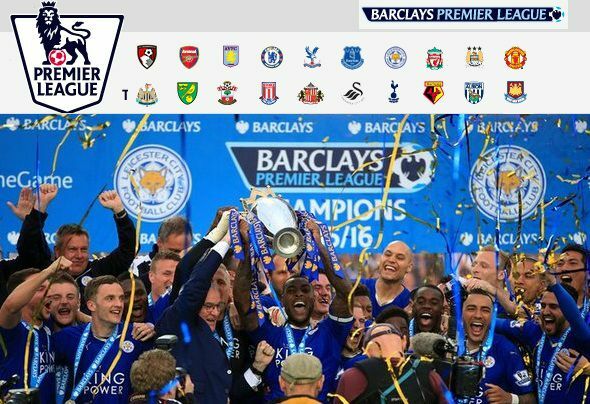 Below is the detailed information about how the Premier League prize money fund is distributed among 20 teams with precisely predicted table. But since the current deal is still active for this season we take a look at how the clubs are going to get paid and what sharing model premier league uses to distribute tv rights money. A prize money fund is produced from the domestic and overseas tv rights deal and here is how it is distributed. Premier League usually confirme the prize money distribution after the season is over but they have already reveal the types of payments and the sharing model. 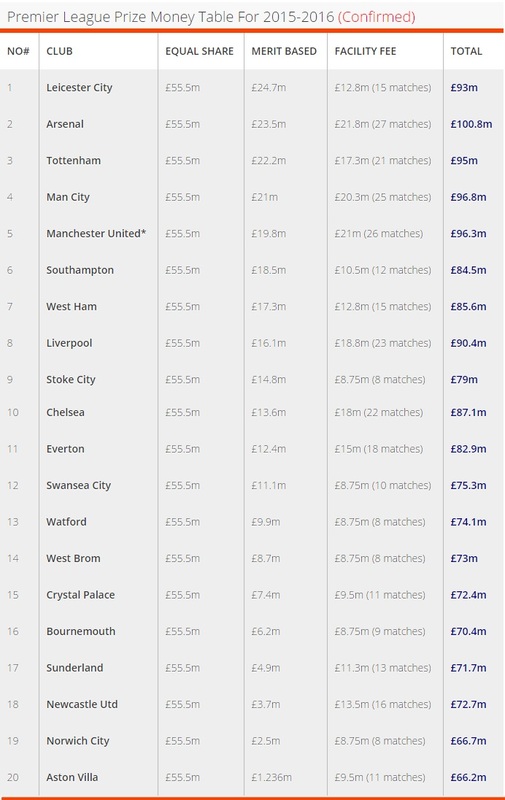 Below table shows how the premier league tv rights funds distributed among the 20 teams in premier league. The total money from 3 year deal of both domestic and overseas is divided into three parts, one part for each of the three seasons the deal is active for. So the total money from current domestic (£3.196 billion) and oversees (£2 billion) three year deal (2013-16) is around £5.19 billion, the total tv money is than spread equally into three seasons which is around £1.73 billion and that makes the yearly prize money fund. The yearly prize money fund comes in two portions. 1) Domestic TV Rights Money. 2) Oversees TV Rights Money. 25% is facility fee (Its the facility fee (£875,000) provided each time clubs match is shown live on tv in UK or £8.75 million for whole season which ever is higher. Below is the confirmed prize money breakdown from 2014-15 season where Chelsea won the league accumulated around £98.99 million while bottom side QPR earned £64.8 million. Your figure for the Man U facility fee doesn’t add up. You mentioned 19.5 for 26 matches put you allotted 20.25 to them. check properly city have 26 matches shown, and they have 20.72mll. 26 * 875,000 = 22,750,000 not 21,800,000. Small error but I would not mind the difference just for some pocket money. Burnley should get 100 million for the amount of games on TV.